With last years’ tax returns now in, it is all the more evident how massive a gift the Trump Administration and Republicans in Congress gave corporate America in their 2017 package of tax cuts. Many of America’s wealthiest corporations received a huge windfall in 2018, even as most Americans face the prospect of declining public services and deepening public debt. Amazon: Had $11 billion in revenues from business in the United States and received $129 million in tax rebates. Netflix: Paid no corporate taxes on over $850 million in U.S. income. Chevron: Revenues from U.S. operations of approximately $4.5 billion and received $181 million in federal tax rebates. These companies managed to avoid taxation by exploiting a range of loopholes in the federal tax code that were either left untouched or actually expanded by the 2017 tax bill. Capital-intensive companies like Chevron and Delta Airlines were able to slash their taxes using Accelerated Depreciation, a provision well known in corporate accounting circles but not widely understood beyond those circles, that allows companies to claim larger tax write-offs for the decreasing value of expensive equipment. Amazon and Netflix were leaders in using stock option payments to their corporate executives to avoid millions in corporate taxes. Even though granting stock options does not directly hit companies’ revenues like salaries would, corporations can still claim the value of the options as an expense and thereby reduce their tax bill. Moreover, these options also allow wealthy executives to avoid paying the personal income tax rate on that income, instead paying the lower rate applied to capital gains. A range of other companies were able to zero out their taxes in 2018 using tax credits for energy production, research and development, and other special treatment still littered throughout the federal tax code. Instead of draining the swamp, the 2017 tax cuts only gave smart corporate attorneys more bog to explore. The result was predictable: Most working families and small businesses got peanuts (or saw their taxes go up) while many of the biggest corporations in the country avoided paying taxes altogether. Sooner or later we have get serious about getting large and profitable companies to pay their share, or we will all end up paying the bill for tax breaks that mostly benefit the most fortunate. The current debate in Raleigh over how to address the billions of dollars in school construction needs is part of a much larger discussion about how to maintain and build the physical infrastructure that makes modern life possible. A new report documents how declining public investments have left America’s roads, bridges, water pipes, sewers, airports, railroads, and schools in bad shape. See our recent report Make Space for Learning on how years of tax cuts and broken promises created the school facility crisis and for analysis of the competing plans currently in the legislature. 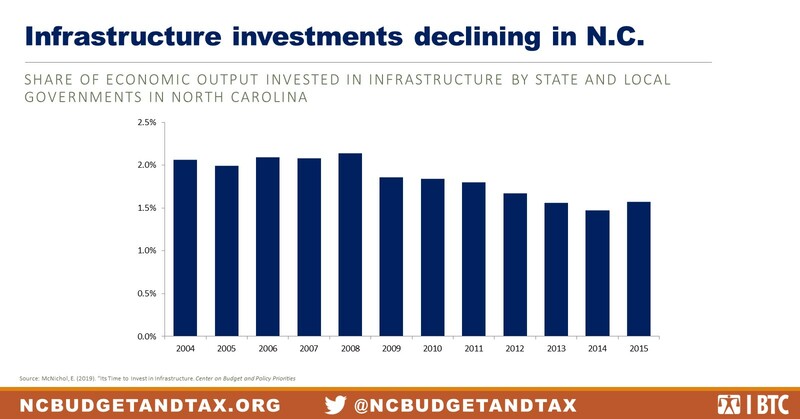 Even as the nation’s engineers sound the alarm, governments across the country are investing less in infrastructure as a share of the economy than at any point since the 1950s, and North Carolina is no exception. Our collective investment in shared infrastructure has fallen markedly, a major reason that our schools, roads, and other systems are in such dire need of an upgrade. As is often the case during economic downturns, the NC General Assembly diverted funds from infrastructure to address the budget crisis created by the Great Recession, delaying repairs and putting off new projects. What came next, however, was less common. Instead of getting back to work when the economy improved, legislators passed several rounds of tax cuts and kept kicking the infrastructure can down the road. The choice to pursue tax cuts that overwhelmingly benefit the wealthy is why we are behind on paying for infrastructure that benefits us all. It is why North Carolina passed the $2 billion Connect NC bond to pay for university, community college, and state park facilities in 2016, it is why the legislature authorized the $3 billion Build NC bond Act to update North Carolina’s roads last year, and it is why we are contemplating issuing bonds this year to pay for school, water, and sewer facilities. Tax cuts have costs, and those costs manifest over time in crumbling roads, failing bridges, and decaying classrooms. Public investments can knit the country together, ensure that our drinking water is free from poison, that our children have inspiring places to learn, and create public spaces and parks that feed the soul. As we can see in the current school construction debate, when we turn away from building a better future, we all suffer. We all know that rich shareholders and global corporations find ways to avoid paying their fair share in taxes, often through complex accounting schemes that boggle the mind. That’s why everyone should take heed of a new report showing that a few tweaks to North Carolina’s corporate tax code could stop global companies from dodging an estimated $373 million in state tax obligations. It turns out that state leaders can ensure that companies pay the proper amount of taxes on income generated from business conducted in their jurisdictions, but existing tax codes at the state level often allow loopholes for smart corporate tax lawyers to exploit. Corporations often use accounting sleights of hand to move income around within the United States and to offshore tax havens, regardless of where the sales and production that created that income took place. Adopting a policy generally known as “combined reporting” that bases a company’s income tax bill on how much of its activity takes place within a given state would prevent large companies from ducking an estimated $17 billion in state taxes that they are currently avoiding. Here in North Carolina, preventing companies from exploiting domestic tax havens (like Delaware) could bring in an additional $151 million in revenue, and stopping the practice of parking income outside of the United States could net another $222 million. Global tax avoidance doesn’t just leave the rest of North Carolinians to pick up the tab, it undermines homegrown companies that don’t have a footprint outside of the state. When global corporations hide income in corporate tax havens, they often get a leg up on companies here in North Carolina that actually pay their state taxes in full, making it all the more difficult for smaller enterprises to contend with their global competitors. Global corporations have already gotten enormous breaks on their federal and North Carolina taxes in recent years which only tilted the economic playing field further in favor of the very wealthy. It’s high time that we compel wealthy shareholders and profitable corporations to reinvest in the county that made them rich in the first place. As legislators return to Raleigh with a long list of vital public needs to address, and not nearly enough state revenue to do the job, this report provides some invaluable guidance. Preventing large corporations from dodging taxes is a win for mom-and-pop businesses, for resident North Carolina taxpayers, and would make our tax system far more balanced than it currently is. Kevin Hassett is the chairman of the White House Council of Economic Advisors, a group that is supposed to inject reason and rigor into the administration’s economic worldview. On Tuesday, he admitted that the shutdown is inflicting more than twice the damage on the economy than the President’s economic advisors had previously claimed, and even Hassett’s new estimate still fails to face the true economic bill that Trump’s shutdown is running up. This simple quote is revealing in a number of ways. Hassett and his team weren’t just a little off — they weren’t even in the neighborhood of the right ballpark. The Council of Economic Advisors now admits that the economic damage is likely to be worse every week than what they had originally claimed would take two weeks to occur. We all make mistakes, but for a group whose core mission is to generate reliable economic estimates, that’s a big error. Hassett’s language also reveals a lack of planning and forethought within the Administration. The choice to close government appears to have considered little more than “staff rule-of-thumb”, rather than a serious attempt to predict the economic consequences that would come from it. Partially shutting down a big chunk of our government is not rule-of-thumb stuff — it’s a major decision that should never be taken lightly. The same lack of serious thought was also on display a few days ago, when Hassett opined that federal employees should be delighted that they’re getting a free vacation (quote begins around the 4:30 mark in this video), and that “in some sense they’re better off”. Even now, the Trump administration still hasn’t fully grappled with the economic injury it is inflicting on our country. With the Federal Government partially incapacitated, key vertebra in America’s economic backbone are suddenly missing. Beyond federal contractors and employees not getting paid, a host of vital economic services are going undelivered. As we have covered before, home loans are not being underwritten, businesses can’t get advice in preparing their taxes, farmers are missing out on crop reimbursements, environmental permitting is not happening, and even breweries can’t get their spring drafts approved. The President’s economic advisors have not released any rigorous analysis of how the failure to discharge these critical functions could undermine our economy, so even the new estimates that Hassett revealed this week are likely to prove an inadequate assessment. Concerns about undermining growth are particularly pressing given the range of risks currently facing the global economy. We’ve had a long run of steady economic growth, but the list of risk factors that could derail that record are growing. Against that backdrop, it is all the more incumbent on the Administration to consider all of the ramifications of their policy choices. Trump’s advisors may not have adequately foretold what would come from shuttering the people’s government, but the real-world consequences of the President’s decision become clearer by the day. President Trump has made it imminently clear that his administration created this shutdown, that a wall along the southern border matters more to him than whether hundreds of thousands of federal employees can make ends meet. More important than families’ ability to put food on the table. More important than whether farmers get reimbursed for crop losses. More important than keeping federal parks safe. More important than a host of other vital government services. This isn’t how our system of government was designed to function. Funding the government is always about compromises and trade-offs made throughout a process that should be oriented toward the good of our country as a whole, but a responsible President would never shut the entire government down over one line item in a $3.8 trillion dollar budget. That’s why the Senate unanimously passed a measure in December that would have avoided the shutdown, and why a similar extension of funding quickly passed when Democrats took control of the House last week. Let’s look at a partial list what the President is willing to sacrifice, and the people he’s willing to harm, in his quest to build a symbol along the southern border. Federal workers not getting paid: Federal employees in unfunded agencies are not getting paid, both those who are furloughed and employees like airport security officers who are still required to report for work. In North Carolina, roughly 7,800 Federal employees are missing paychecks, a count that does not include contract workers and state employees whose salaries are paid with Federal funds. The agencies with the most employees going without pay in North Carolina are the Department of Agriculture (1,900 employees), Environmental Protection Agency (1,200 employees), and Homeland Security (1,100 employees). Friday January 25th marks the second missed paycheck for impacted federal employees, and many of these families have already run through their available savings. These effects are all the more burdensome because furloughed federal employees can apply for Unemployment Insurance, but have thus far been prevented from collecting payments. A number of states are exploring ways to provide temporary financial relief to federal employees that are not getting paid, but a clear solution has not been implemented in North Carolina. Federal contractors. In addition to official federal employees, many North Carolinians who work for companies on federal contract may be laid off or forced to take time off without pay. While there are no reliable estimates of the number of businesses or workers who are losing pay in North Carolina because of the shutdown, the harm is substantial and will only grow with time. Food Aid: The Supplemental Nutrition Assistance Program (SNAP) benefits are still being distributed, but the shutdown is already making it harder for North Carolinians to use them. Because the United States Department of Agriculture is unable to renew contracts with stores that normally accept SNAP benefits, more than 150 retailers in North Carolina have been forced to stop participating in the program, many in parts of the state where access to food is already limited. If the shutdown lasts into March, families and children who receive SNAP could go hungry. The Department of Agriculture, which administers the SNAP program, is still issuing checks for now, but available funds could be exhausted within the next several weeks. Housing Assistance. Payment of rental housing assistance and other programs serving the elderly and others continue to operate for now, but Department of Housing and Urban development informed landlords that its ability to continue payment depends on how much budget authority the agency has, raising the potential that housing assistance could run out. If the shutdown persists, HUD could be unable to renew contracts with local entities that provide housing. It is estimated that over 115 contracts with low-income housing providers have lapsed, threatening the housing security of nearly 2,000 units across the state. In addition, inspection of existing housing units has largely been suspended which may force low-income families to live longer in unhealthy conditions. Native American health and social services. Many Native American tribes have seen funds for healthcare and other vital services dry up. The Federal Government is legally obligated to support services like medical clinics, food pantries, and educational programs, but the shutdown has stopped many of these payments. This has forced some services to be reduced or eliminated altogether. Temporary Assistance for Needy Families (TANF). TANF (Temporary Assistance for Needy Families), a federal block grant, is at risk of a lapse in funding. North Carolina could feel the impacts as early as the first few weeks of February, according the National Governors Association. TANF helps to fund our states child care subsidies, NC PreK, and provides cash assistance to families in need. Both the U.S. House and Senate have passed H.R. 430, a bill that extends funding through June. The bill awaits the president’s signature. Hurricane Florence rebuilding. North Carolina is unable to use $168 million in Community Development Block Grants until guidelines are issued by the Department of Housing and Urban Development (HUD), which has been delayed by the shutdown. This is preventing the State from deploying these funds to assist communities in rebuilding after Hurricane Florence. Farming Relief Funds. With the United States Department of Agriculture (USDA) unfunded, funds are not being distributed that are meant to reimburse farmers for income lost to last year’s hurricane and the ongoing trade dispute with China. With an estimated $1 billion in lost crops due to storms alone, and with farmers trying to plan for the upcoming growing season, any gap in processing relief claims will severely impact one of North Carolina’s most important industries. David Smith with the State Department of Agriculture and Consumer Services said, “We’re already hearing from farmers who are pretty desperate for relief money.” While some USDA staff were recalled temporarily this month, it remains unclear how many of these reimbursements will be processed and distributed. Farmers’ Planning: USDA crop reports that play a critical role in farmers’ planning for the upcoming year are not being released. As farmers are trying to make decisions about what crops to plant for the approaching growing season and which livestock to invest in, lacking these government surveys could undermine North Carolina’s vital agricultural economy. Particularly in the modern data-driven agriculture economy, the government shutdown is making it far harder for farmers to make informed decisions. Small Business Loans: Loans provided by the Small Business Administration (SBA) are not being processed, cutting off Mom and Pop enterprises from a vital source of capital. SBA loans are often used to get businesses off the ground, purchase new equipment, make building upgrades, or buy the raw materials needed to fill orders. Because banks are often hesitant to make loans to small businesses, closing the SBA means that some companies may be unable to expand, or may close entirely because they cannot access this essential source of business capital. Home loans. Several federal agencies that help people purchase homes are shuttered, preventing some applications from being processed and therefore preventing potential buyers from being able to close on the houses they hope to call home. The Federal Housing Authority has said that it will not make new multi-family commitments during the shutdown, the Department of Agriculture has similarly communicated that new rural housing direct loans will not be issued, and the Federal Housing Authority gave notice that it will not make insurance endorsements under the Home Equity Conversion Mortgage program, which is designed to help senior citizens to convert some of the equity in their homes into cash. Development permitting. EPA will have little to no capacity to process environmental approvals for real estate projects. In a prolonged shutdown, the inability of EPA to process applications could become a profound drag on the economy, preventing new developments from coming into being. Federal parks unprotected. While most Federal Parks remain technically open, park staff have been sent home and most visitor centers are shuttered. In spite of valiant efforts by volunteer groups and communities, trash is building up and many park advocates worry about mounting damage to natural and cultural treasures because the parks are not being patrolled as usual. Portions of the Blue Ridge Parkway are closed. Federal Parks are technically open, but portions of the Blue Ridge Parkway have been closed. With maintenance workers furloughed, no one is available to clear trees brought down by recent winter storms, rendering large portions of the iconic route impassible. Beer, Wine, and Spirits: The Alcohol and Tobacco Tax and Trade Bureau, which processes applications for new labeling is closed, preventing producers from getting new products approved. While by no means the most important impact, it’s an example of the many Federal services that often go unnoticed until they are no longer being performed. University and Research Funding: If Trump goes ahead with his threat to keep the government shut down for months, university research funding could dry up, threatening several schools in North Carolina that depend on federal funds to pursue their research and teaching missions. 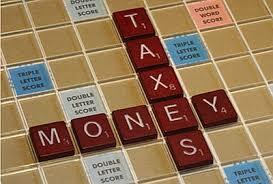 Tax filing. 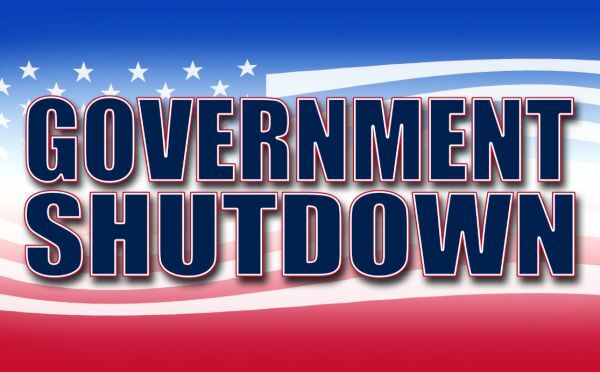 With tax season just around the corner, a significant portion of the Internal Revenue Service (IRS) staff is furloughed. While the administration has pledged that tax refunds will still be issued if the government shutdown persists, it is unclear how the herculean task of processing tax returns can be completed if the already understaffed agency is working with a fraction of its employees. Beyond refund checks, the outage would surely frustrate taxpayers trying to get their questions answered so they can submit accurate returns. Given the already real underfunding of the country’s Internal Revenue Service, the disruption of the current government shutdown could compound the challenges of administration. Victims of domestic violence. Because the Violence against Women Act and the Victims of Crime Act lapsed in December, many local organizations that provide shelter and support to victims of domestic violence are at risk of closing. Many of these life-saving services in North Carolina are provided by non-profit organizations that are already facing the prospect of closing if their federal contracts are not renewed. Federal Investigations: Most agents with the Federal Bureau of Investigations are considered essential employees and are working without pay during the shutdown. However, a lack of funding is starting to seriously undermine exiting investigations. A few specific impacts include losing informants because agents lack to funds to pay them, inability to set up sting operations in drug cases, and delays in issuing indictments. Federal courts: If the shutdown lasts past February 1st, Federal courts may have to start closing their doors. The Federal administrative Office of the Courts estimates that sufficient funding exists to keep Federal courts open through January 31st, but not much after that. Testing for GenX. The State Department of Environmental Quality (DEQ) continues to sample wells for GenX, but the Federal laboratory that would normally run the tests is closed, so samples are piling up in DEQ’s Fayetteville office. Immigration Legal Proceedings: Immigration courts have suspended hearings on immigration cases where the people involved are currently in detention. This will result in unknown and potentially lengthy delays in resolving cases. Given the backlog of immigration cases, canceling hearings could leave applicants in legal limbo for months, and possibly even years. Food inspections. If the shutdown persists, the frequency of food safety inspections could be reduced, potentially exposing the eating public to serious risk.